Transport of dangerous goods is regulated in order to prevent, as far as possible, accidents to persons or property and damage to the environment, the means of transport employed or to other goods. However, with different regulations in every country and for different modes of transport, international trade in chemicals and dangerous products would be seriously impeded, if not made impossible and unsafe. Moreover, transport of dangerous goods are also subject to other kinds of regulations, e.g. work safety regulations, consumer protection regulations, storage regulations, web, environment protection regulations. In order to ensure consistency between all these regulatory systems, bodies such as the United Nations have developed mechanisms for the harmonization of dangerous goods transport classification criteria and hazard communication tools as well as for transport conditions for all modes for transport . In addition, the United Nations administers regional agreements that ensure the effective implementation of these mechanisms as far as transport of dangerous goods and freight by road, rail and inland waterways is concerned. 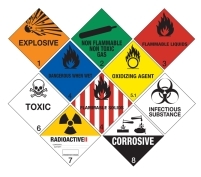 Any goods that pose a risk to people, property and the environment are classified as dangerous goods and are assigned to different classes ranging from 1 to 9. These types of goods can range from those which are highly dangerous to everyday products such as paints, solvents and pesticides found in the home and at work. When transported these goods need to be packaged correctly as laid out in the various international and national regulations for each mode of transport to ensure that they are carried safely to minimise the risk of an incident. If you are involved in the Carriage of Dangerous goods by road, you need to comply with the relevant requirements laid down in the European Agreement Concerning the International Carriage of Dangerous goods by Road (known as ADR training) for the specific substance you want to transport.